Portland Police Chief to Ignore Legalization Initiative Victory. Portland, Maine, voterd Tuesday to legalize the possession of small amounts of marijuana, but Portland Police Chief Michael Sauschuck said his officers will continue to issue citations for pot possession under state law. But Sauschuck also said Portland police didn't consider small-time pot possession a high priority even before Tuesday's vote, and the numbers back him up. In the last two 12-month periods, police there have averaged about one pot possession ticket a week. Medical Marijuana Groups Launch Fundraising Campaign for 2014 Arkansas Initiative. Arkansas medical marijuana advocates Arkansans for Compassionate Care (ACC) have joined forces with the national advocacy group Americans for Safe Access to raise enough money to get the Arkansas Medical Cannabis Act initiative on the 2014 ballot. The campaign kicks off Saturday in El Dorado with a concert sponsored by Budweiser (! ), which will give a portion of the proceeds to ACC. Urban Institute Report Says Best Way to Reduce Federal Prison Population is Modify Sentencing, Prosecution Policies. A new report from the Urban Institute, Stemming the Tide: Strategies to Reduce the Growth and Cut the Cost of the Federal Prison System, concludes that "reducing the number of drug offenders is the quickest way to yield an impact on both prison population and cost," and recommends changes in both prosecution ("front end") and sentencing and reentry ("back end") policies. 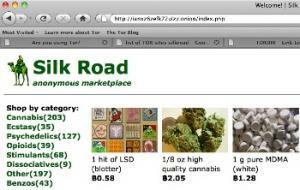 The Silk Road is Back. The anonymous online marketplace notorious as a drug-buying and -selling venue is back up and running. It went down earlier this year when FBI agents arrested its operator, Ross Ulbrict, but was up again as of yesterday. David Nutt Calls Britain's Drug Laws an Obstacle to Research.Scientist David Nutt, the former head of the Advisory Commission on the Misuse of Drugs, says Britain's drug laws are stifling research into the benefits of drugs like marijuana and Ecstasy. "The UK has gone from being early adopters of evidence based harm reduction -- prescription heroin, needle exchanges and opiate substitute therapy -- to lagging behind many countries across the globe that are modifying their drug policies to better reflect advances in our understanding of drugs," he told Forbes. Nutt, who was fired from the commission over his views on drug policy, recently won the John Maddox Prize, which is awarded for courage in promoting science and evidence on a matter of public interest in the face of hostility. Irish Parliament Rejects Marijuana Legalization. The Irish Dail (parliament) soundly rejected a bill to legalize marijuana Wednesday. The private member's motion filed by TD Luke "Ming" Flanagan was defeated on a vote of 111-8. Still, the occasion marked the first time the Dail has seriously debated marijuana policy. Czech Activists Denounce Grow Shop Raids, Plan Protests. The Czech marijuana reform group Legalizace has denounced Monday's mass raids on grow shops as "an absolutely unacceptable and scandalous infringement upon civil rights and freedoms" and is calling for a protest Saturday evening at Prague's Old Town Square. Iran Drug Executions Continue. The Islamic Republic of Iran is the world's leading executioner of drug offenders, and this month is no different. According to the anti-death penalty group Hands Off Cain, which monitors Iranian press reports, 11 people have been hung for drug offenses so far this month, and we haven't even finished the first week. The annual number of people executed for drug offenses in Iran is in the hundreds. The drug war hurts people and governments everywhere. America sets the example that it is ok to hurt people for supposedly hurting themselves. This is sickening.